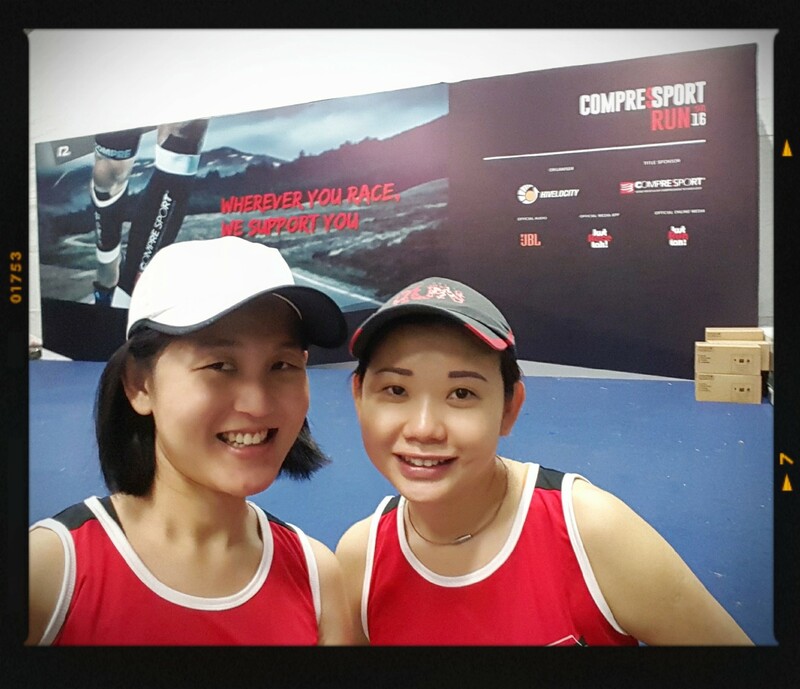 Race Review: Compressport Run 2016 [10 Km] (by Rebekah Ong) | JustRunLah! 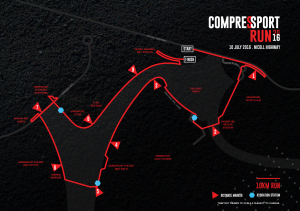 Today, the 10th July 2016 is the first ever Compressport Run in Singapore. 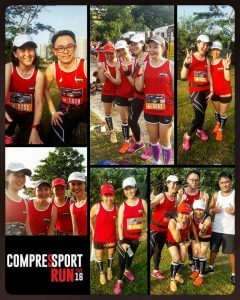 One of the main aims of the Compressport Run is for the running community to gather and run together and at the same time promote their brand as one of the world’s most popular compression wear. 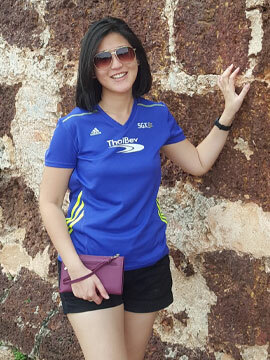 The starting point of the run is at Nicoll Highway. I joined the 10 KM category. 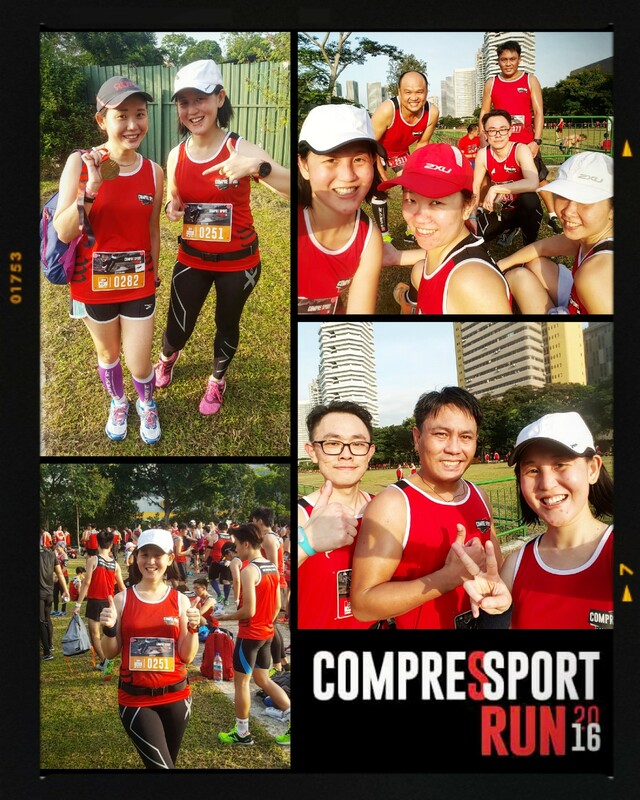 What attracted me to sign up for this run event was that the 10KM Run participants were entitled to one of Comperessport latest products, the Compressport Compression Calf Sleeves R2V2 which was worth S$79.00 and comes inbuilt with the latest Knee Support Technology. I thought it was a real steal and without hesitation, I decided to fill up and complete my registration!! Race pack collection was held at City Square Mall, Fountain Square from the 1st to 3rd July 2016. I went on a Sunday to collect around 16:30hrs. There wasn’t a queue at all and the collection process was really smooth and quick. 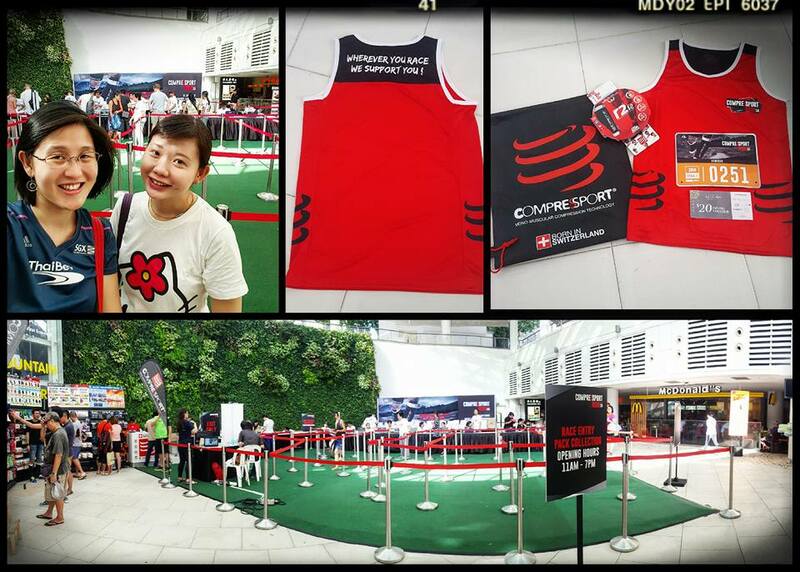 Though the collection was efficient, I was really disappointed when I went to collect my Compressport Compression Calf Sleeves R2V2. I only had 2 colours to choose from which was Black or White for my selected sizing. I chose the White colour. What I thought could have been done better was to give participants an option to choose during registration what colour they would have preferred regardless their race category. This would give us a stronger reason to sign up because we know we would be getting something we want and at the same time, there won’t be any let down when race pack collection comes. It would be much easier for the organiser so that they can cater to everyone needs. The race pack was a standard Compressport Tote bag, with some sponsors vouchers, Compressport Compression Calf Sleeves R2V2 (10KM) and the race event tee. I would have loved to see some samples or drinks inside but there weren’t any. The flag-off for the 10km was 06:30 hrs. Starting a run event earlier is a good idea as it’s much cooler running at that timing but there wasn’t any public transport available so my friend and I decided to take a cab down to the race site. We would have preferred for the organiser to have planned for shuttle buses so we didn’t need to spend an exorbitant taxi fax to the race site. A lot of the other runners were also requesting for shuttle services but there wasn’t that option given. We arrived at the race site around 05:40 hrs and headed straight for the bag deposit area. Bag deposit service was smooth but a little slow and took up a bit of time. We then headed across the dark field towards the toilets which were near the stage. Thankfully the field was not muddy!! If not I think I would be squealing and trying so hard not to get my shoe dirty! More lighting around that area would have been a welcome because it was so dark. Queues at the toilets were long and we had to wait an estimate of 10 mins before it was our turn. After all the queuing and waiting, we made it to the START pen but not early enough to be in the first wave. The 2nd wave which as flagged off 5 mins after the 1st wave had gone. The route was a really scenic one!! One of my favourites so far among all the races I’ve participated in this year. The race took us from Nicoll Highway –> Singapore Sports Hub –> Tanjong Rhu –> Gardens By The Bay (East) –> Marina Barrage –>Gardens By The Bay (South) –> Over the bridge beside the Double Helix Bridge –> Olympic Youth Park –> F1 Pit Building –> Nicoll Highway (End). Never a dull moment! Though the route was generally flat, there were small slopes that required quite a bit of effort. 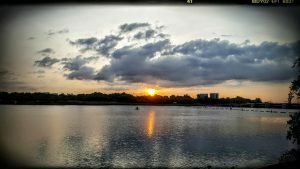 I felt the strain after the 6km mark and decided to slow down a bit and take some photos of the awesome sunrise that was happening in the distance. 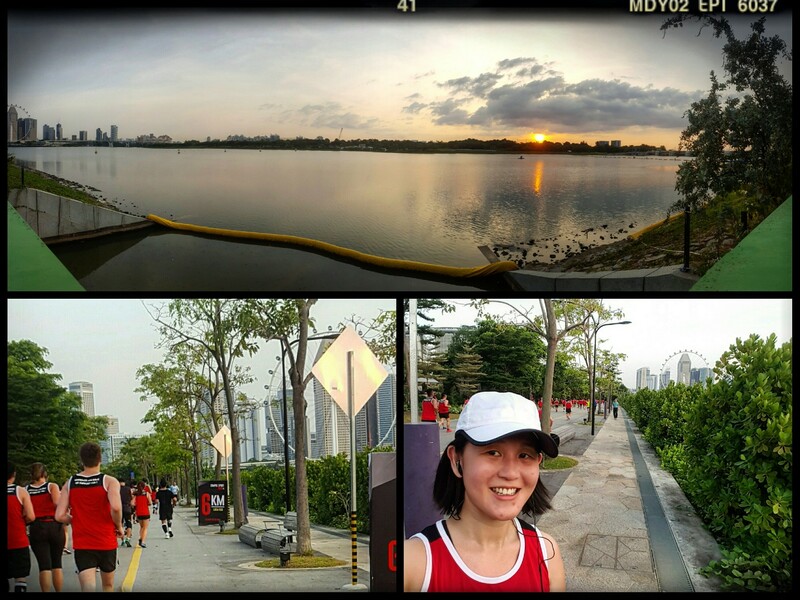 [Top Pic: Me at the 6km mark just slowing down for a short break before continuing on. There were altogether 3 water points which were placed at various parts of the routes, mainly the 2, 5 & 7km marks. Though sufficient hydration points were planned but not all of them had isotonic drinks. Only the last one had 100 plus. 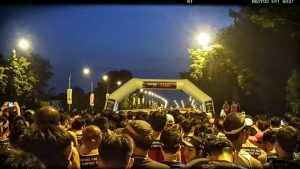 Maybe the organisers could plan to supply isotonic drinks at all hydration points as this would really benefit the participants. I completed my run with an unofficial time of 1 hr 13 mins. It was a good run and I’m glad that I got my weekend workout in! 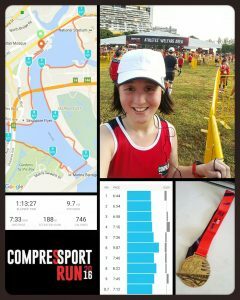 Overall the Compressport Run is a good run event but there’s definitely room for improvement which I’ve highlighted in this write-up! Till my next write-up, let’s all stay #LeanStrongAgeDefiant!